The Trump White House steps up the pressure on President Nicolas Maduro. 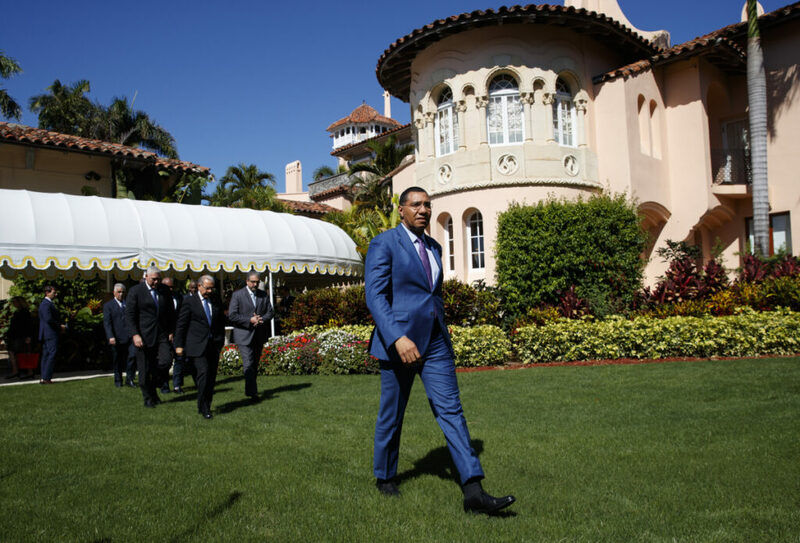 PALM BEACH, Fla. — The Trump administration stepped up sanctions on Venezuela on Friday in response to the kidnapping of a top aide for a leader the U.S. wants to see replace the embattled – but not yet ousted – President Nicolas Maduro. The Treasury Department announcement came while President Trump met with leaders from five nations in the Caribbean that generally support the U.S. call for an end to Maduro’s rule. Trump hosted them at his Mar-a-Lago club in Florida and pledged U.S. investment in their countries. “We’re not bluffing when we told Maduro not to do stuff like this (the kidnapping),” John Bolton, Trump’s national security adviser, told Univision News in an interview aired Friday. The U.S. has already sanctioned scores of top Venezuelan officials and has blocked U.S. banks from doing business with that country, imposing a financial stranglehold on the cash-strapped nation. The sanctions announced Friday also came as members of Congress from both parties condemned Marrero’s arrest. The Trump administration considers Maduro’s government a dictatorship and says he was re-elected in an illegitimate election. The country is in an economic meltdown and millions of Venezuelans have fled.